Great video from Tim James, author of The Speed Flying Reference Guide of him getting used to his new glider the new Ozone Firefly at 'The Pines' and 'Mystic', in Victoria, Australia. Ozone Firefly First Flights from Tee Jay on Vimeo. Turbulence have some effect on all flying naiilons. I consider Ozone FF to be more safe in turbulence hence other hibrid wings. 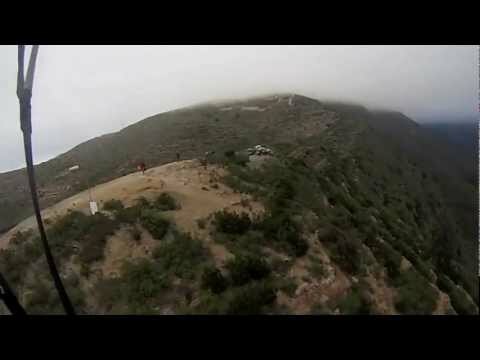 I must say, that particular day, both the bobcat's and specially the spirouline's pilot landed saying that it was kind of turbulent wind, while I felt confortable and stable (dought gusty) flight. About the leg, I'm just recovering now, (That's why I have so much time now to visit the forums). Just 8 days from taking the ferule away. Back in the air soon! What was the wind speed during the flight ? @ Marcos - cheers for posting details of your experience flying the Firefly - sorry to hear about the broken leg. Didn't say when it happened but wishing you a speedy recovery and your back flying soon. Here's some video of my FireFly soaring next to a Gin Bobcat 18m. and a Little Cloud Spirouline 18m. I would say (stimated) the G.R. must be between 5 and 6 to 1. It is obviously some less than the spirouline, and slightly less than the bobcat with not much difference. I've recently got a Firefly and flew it for 6 or 7 times in different sites. So far I have to agree with both sides of the story, that is: It seems to me like a really hybrid wing, with a nice compromise between performance, ( I usually fly next to, and have tried, a 18m bobcat, wich has a slightly higher GR, if paying a lot of attention. they seem very similar), but quiet safe, & easy to handle. (to me, a bit easier than the bobcat). Dought, I also have to agree about not being too confident about collapses, I did got in some turbulence, mostly w/not problem, and the last one, collapsed most of my wing, leaving so little wing remaining, that it stalled, all this while close to the terrain. It did reinflate pretty fast (toward the slope, of course), witch ended with a broken leg. (lucky after all). So, they are kind of solid, but they DO collapse. Well, I don't know if it rates as an XC flight, but I'm calling it that!! Wind was 16-20kts, and once I got airborne I realised there was an opportunity to rack up some miles. The Firefly got me further and higher than I've ever been on a speed wing at my local coastal sites. I was totally blown away. I have wanted to attempt this flight for ages, but the XT16 couldn't do it. Each time I tried I ended up on the beach. And thanks to the Firefly's awesome stability in turbulent air, I even got to top land about 100m from my car! Firefly Coastal XC Flight from Tee Jay on Vimeo. I have been flying the Firefly a lot lately, and I find it to be quite an amazing wing. I have both an XT16 and a Firefly. Consequently I can fly them at the same site, in the same conditions. Both handle turbulence well with no signs of collapse, but the Firefly feels crisper and more responsive to toggle and weight shift input. Also, top landings are easy with all the extra performance. But the big difference is the Glide Ratio. I am 95kg (210lbs), and in 18-22kts at a small 20m cliff site, I can sustain height on the XT16, but I can't get above launch height. On the other hand, the Firefly easily goes 20m above launch, which gives me more sky to play with. And in 12-16kts I can sustain height at that same site on the Firefly, which is utterly impossible on the XT16. I have also found that the Glide Ratio does exceed 5:1, as can be seen in the video Alan kindly posted from a flight I did at Mystic, in Victoria, Australia. I think it is worth pointing out that the Glide Ratio of a wing will not change, regardless of the All Up Weight being flown. Changing the All Up Weight changes the speed, not the Glide Ratio. So if you have two pilots, one flying at 60kg and one at 100kg, and they are flying exactly the same trim settings, they will land at exactly the same spot in nil winds, but the heavier pilot will simply get there faster. Also, the heavier pilot will be able to soar in stronger winds, but conversely, he will not be able to sustain height in lighter winds, which will support a lighter pilot. I'm sure Ozone could have cranked the Glide Ratio of the Firefly right up but, in my opinion, they have struck a sensible balance between glide performance and safety. The Firefly is a true hybrid wing, offering mini-wing performance, with the safety offered by speed wings like the XT16. The last thing I want while flying in turbulence is an asymmetric collapse while close to the ground. I feel just as safe when punching through turbulence on the Firefly as I do on the XT16, except now I can fly at more sites, more often. Ozone have not re-badged the XT16. They have created an advanced wing that will not put pilots at risk unnecessarily, as many other manufacturer's wings do. I should also point out that I am not sponsored by Ozone, and I have no vested interest in promoting their wings. I wrote The Basic Speed Flying Reference Guide around the XT16 because I believe it is the best entry level wing on the market. I purchased both my XT16 and my Firefly because I feel they safely deliver the performance they offer to their relevant target market.